A lingering question for the past several weeks has been “what makes a classic, classic?” Classic music, classic art, classic design. Daft Punk is great, but will they be great twenty years from now, fifty years, a century from now. Chopin’s melodies have been time-tested, generation-proved. Go back even further. The Beethovens, the Mozarts, and the Bachs’ melodies have not gone out of fashion. In fact, with time, their music has aged beautifully. Re-mastered, re-engineered, and re-performed, these classics became classics through the pressures of time. While Zorba speaks of what we do with what we eat, the basic premise is the same. Nothing speaks more of a culture’s values than its food. How about that classic kimchi. Classic kimchi, you ask, seems redundant, no? As a traditional Korean food, is it not already, by definition, a classic? I emphatically say no. Most of the kimchi we consume is mass-produced on some factory line. Thousands of split cabbage heads shifted along moving belts, harassed by menacing gloved hands, carelessly tossed with mysterious red filling. There is nothing classic about a classic food produced in such a way. Kimchi was not always made like this. Kimchi was never meant to be some hip new thing to try at that hip new Korean barbeque joint down the street. 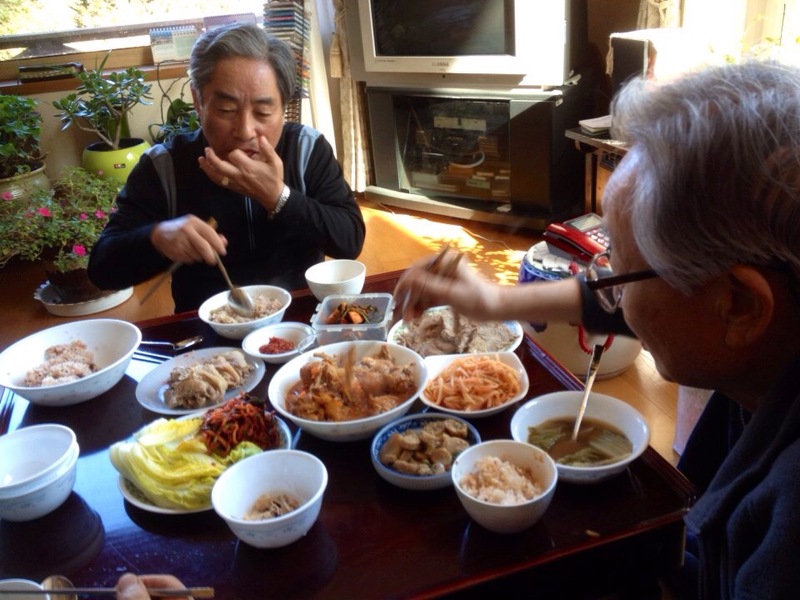 At its core, kimchi, and the art of “gimjang,” was Korea itself. It’s about the soil. It’s about people. In the coffee world, there is something known as the “Third Wave,” a revitalization of sorts for organically grown, meticulously processed, carefully sourced, expertly roasted, and artfully poured single-origin coffees. At the heart of this movement is knowing where your beans come from, which country, which region, which micro lot, which farmer. The same applies to kimchi. “Third Wave Kimchi” is knowing where your cabbage came from, who grew your radishes, who processed your red chili flakes. The concept of farm to table should directly apply to any meaningful bag of kimchi you consume. Good coffee tastes of the soil it came from. Real pork tastes like, well, pork. Does your kimchi taste of the soil? Or does it taste like the metal and plastic conveyor belt of some factory? There is beauty in mortality; its fleeting nature adds value to every second of its existence. Gimjang is vanishing. And its slow vanishment has breathed a new life into the tradition, as evidenced by UNESCO’s likely decision to list kimchi, and the making of kimchi, as an intangible world heritage. Kimchi would be Korea’s 16th item on the UNESCO list, which includes ancestral royal rites, a percussion instrument performance, and a five-thousand year old dance routine. The final decision is due in December when UNESCO’s intergovernmental committee meets in Azerbaijan. The world is watching. But the question is “what” it is looking for. Kimchi is kimchi. What makes this product special is the art of “gimjang,” the traditional communal event based entirely on the making of kimchi. The final product is probably UNESCO-worthy. What’s definitely UNESCO-worthy is the process of making it. Last November, I wrote about the history of kimchi and gimjang, and its detailed, laborious process (read the piece here). If that piece served as an overview of gimjang, this piece focuses on the people behind the art, the faces of kimchi. Microlots are not only applicable to coffee farms. 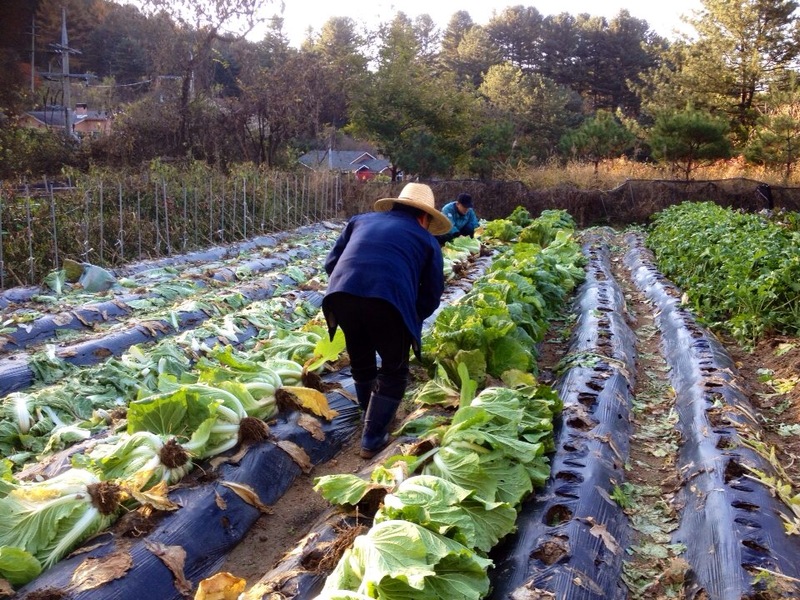 Throughout the suburbs of Korea, there used to be countless microlots with cabbages, radishes, green onions, and chilies, the basics of kimchi. 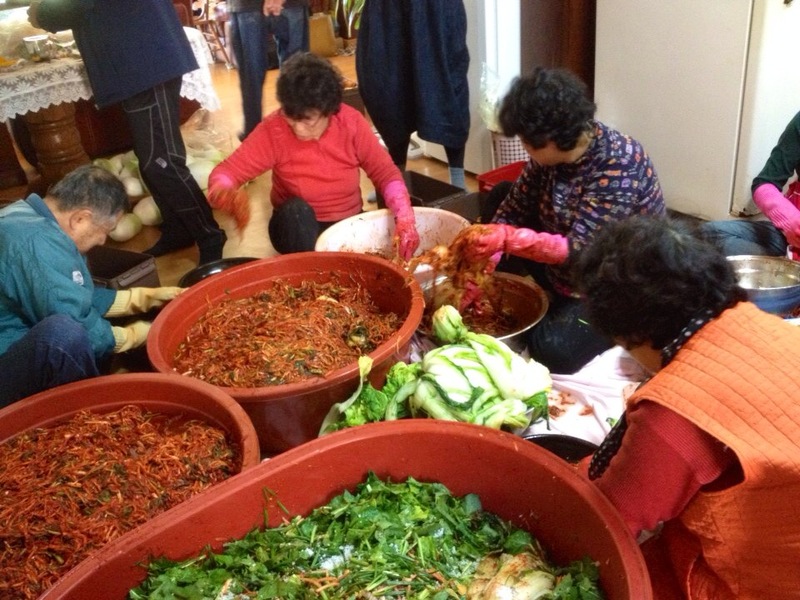 Around the end of October (according to the lunar calendar), households gathered together for a two-day kimchi marathon. Literally after moments of being picked from the field, the cabbage is cleaned, chopped, and bathed in ice-cold salt water. Radishes are peeled and sliced for the filling, which involves rice paste, fish sauce, and ridiculous amounts of red chili flakes. 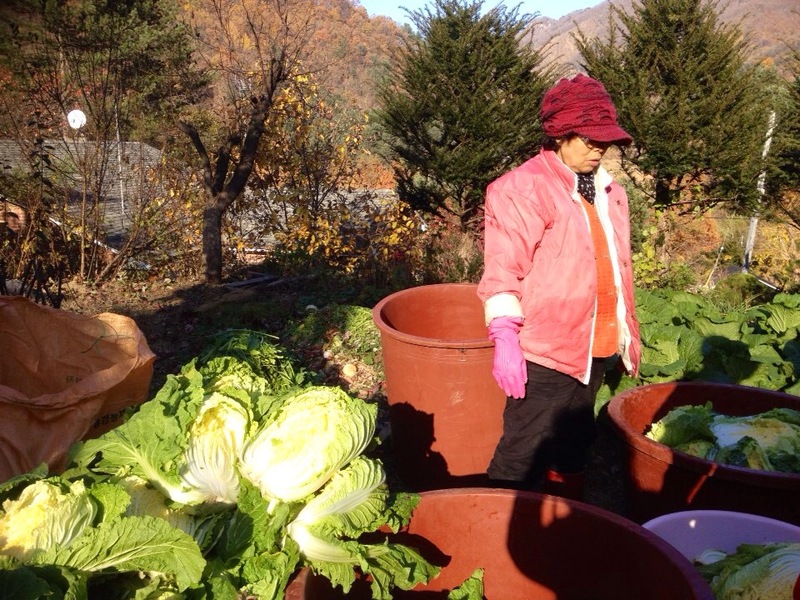 Usually, hundreds of heads of cabbage are involved, as the kimchi made on this occasion is meant to last the entire winter season. Anyone who has been fortunate enough to take part in this proceedings will tell you: the best pork in Korea is the pork you eat during gimjang. It’s a tradition within a tradition. A kimchi sampler of sorts is prepared; some raw cabbage, cabbage soaked in salt water (not quite pickled, just overnight), kimchi filling, and buttery soft pork belly boild in light dwenjang. If you’re lucky, some fresh oysters on top. This feast is enjoyed by all the helping hands – family, friends, and neighbors. The pork is, sadly, no different from any other cut of pork consumed on any other day. It’s the occasion that makes the pork special. A day’s hard work (and more work to come) with family and friends, a bustling household with barely any room to spare, knees touching, aunts yelling, porcelain clanking. The two-day ordeal produces loads of kimchi. Everyone that helped out takes a container or two home. It’s more than earning your share. You take away a piece of that familial gratitude, communal belonging, a sense of friendly cooperation before the harsh winter hits. It’s more than food. It’s more than just kimchi. You take home a piece of gimjang. Before it vanishes for good. Every year, the number of households conducting gimjang is diminishing. It’s too much work. 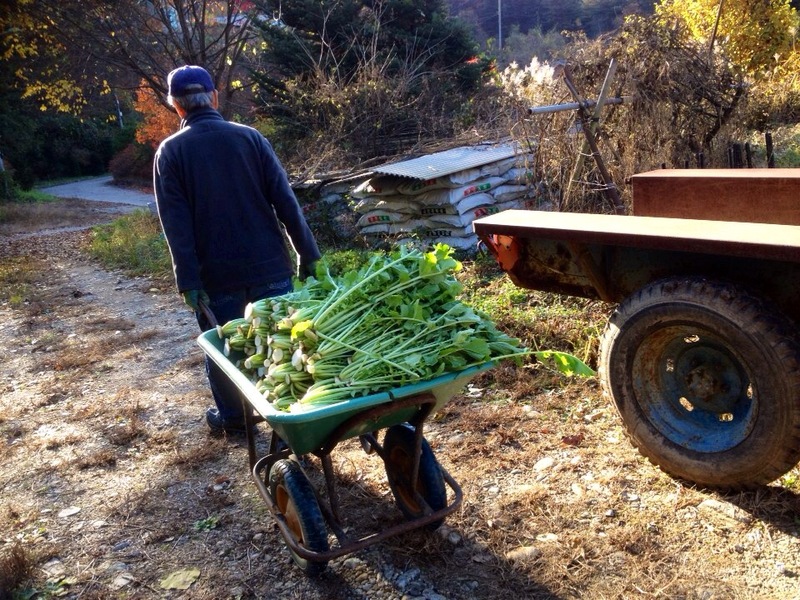 More and more people are moving to Seoul and other metropolitan areas, away from the soil, away from the farm. The nearest “supermart” carries ten different types of kimchi, all nicely packaged, ready to be consumed. In defense of this vanishing phenomenon, some people actually make their own kimchi, sourcing only organic ingredients and carefully applying the hand-me-down recipes. But home-made kimchi is not “gimjang” kimchi. Granny Choe’s kimchi may be organic, is probably made with a grandmother’s love and care, but it is not “gimjang” kimchi. It lacks the fundamental ingredient of community, of seasonality. By definition, gimjang is not an individual activity. It begins and ends with the gathering of a community. The harvest, the cleaning, the chopping, the soaking, the mixing. It all revolves around a multitude of people. An event that brings people back to the table. That’s classic. Time-proven. People-tested. When the rest of the world jeers at that slow, laborious, burdensome happening. When the rest of the world praises speed and convenience. When the rest of the world label food as a trend or fad. The old folks head back to their field, back to their soil, back to their gimjang. 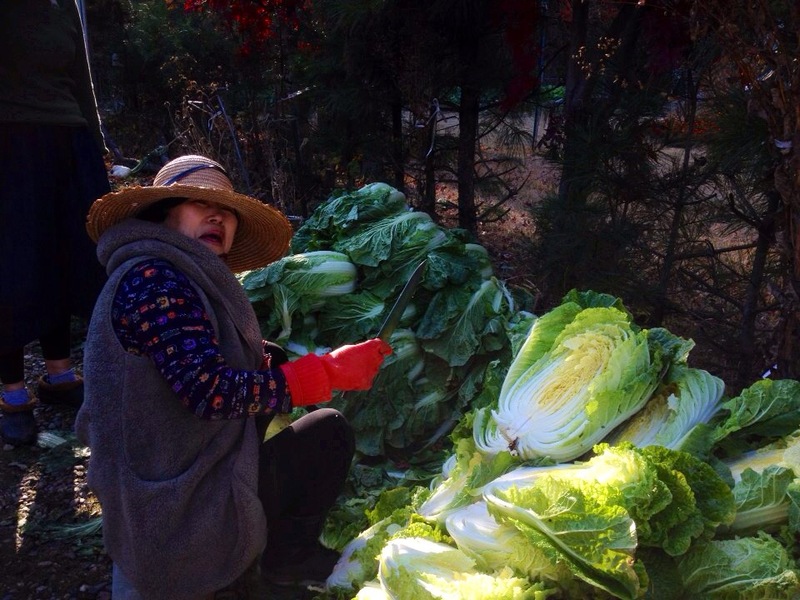 But as this “last face of kimchi” disappears with time, who will preserve the tradition? UNESCO? Maybe. Not without an eagerness to get back to the soil. Not without a willingness to slow down, to step aside from the never-ending clockwork of metropolitan society. Not without a fondness for the old, the classic. Who will bring that back? With bellies stuffed with fresh kimchi and the best cut of pork, the old folks have the final laugh. A laugh that may just be slipping through our very fingers. Really intersting article. Bravo !